My TiVo recorded a suggested show this morning on European Christmas markets. So I promptly sat down and watched the whole thing - even though the family's coming over tonight and I have cooking to do . It's funny that I long to be in Europe at this time of year considering how much I longed to be home when I actually lived there. The grass is always greener syndrome I guess. What makes me love Europe this time of year, Germany in particular, is how Christmas is still done Old School for the most part. It's not about the STUFF: how much you have and how much more you can get. It's about a feeling, an atmosphere. The Christmas market is the perfect example of this atmosphere. 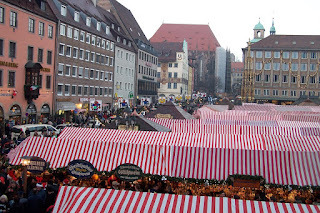 Parked in the middle of historic town squares, Christmas markets are akin to being shrunken down and walking around one of those little Christmas villages you put under your tree. And even though the air is cold, you feel warm sipping from a mug of steaming Glühwein. I wish I could be there right now.